German Chancellor Angela Merkel is not interested in listening to those who advocate democracy and human rights in Turkey, chief editor of the Turkish opposition newspaper Cumhuriyet, Can Dundar, said in an interview with German newspaper Bild. Turkish police detained a gunman attempting to assassinate a prominent opposition journalist outside a courthouse in Istanbul, local media reported Friday. 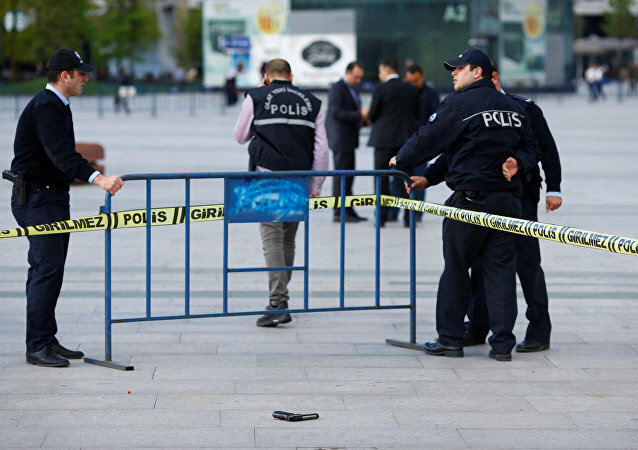 An unknown attacker shot Can Dundar, the editor-in-chief of the Turkish newspaper Cumhuriyet, in front of a court house in Istanbul, Hurriyet Daily News reported. In the latest sign of Turkey’s continuing crackdown on freedom of the press, Ankara is moving forward with the trial of two journalists who revealed the government’s role in arms smuggling. Radio Sputnik’s Loud & Clear speaks with Turkish journalist Kemal Okuyan to discuss Erdogan’s war on truth. 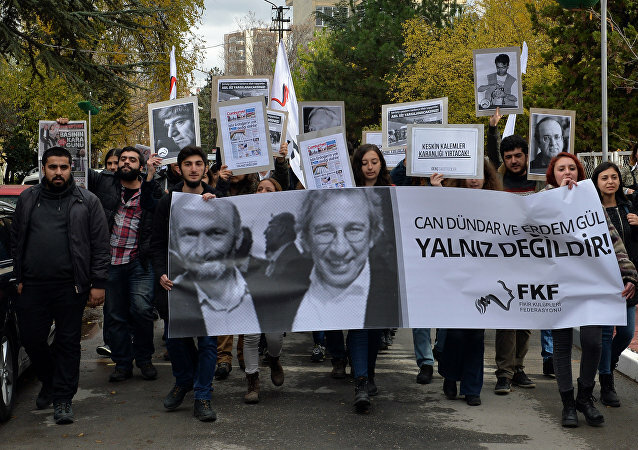 New allegations against Turkey's Cumhuriyet journalists in a controversial secret trial could only further unravel the case, one of the defendants, Can Dundar, told Sputnik Turkiye. Turkey's recent crackdown on press freedom has sparked diplomatic tension with some of the country's western allies, with Turkish officials reacting angrily to recent criticism of Ankara's approach to media regulation. Turkey has issued notes of protest to foreign missions in the country over the presence of EU diplomats at the court hearing of two top journalists from the Cumhuriyet daily accused of revealing state secrets, local media reported Monday, citing a Turkish diplomatic source. Two prominent journalists are scheduled to go on trial in Turkey on Friday for their investigation revealing alleged state arms supplies for rebels battling government forces in Syria. The United States welcomed the decision of a Turkish court to release from pre-trial detention two journalists arrested over investigating Ankara's efforts to provide weapons to militants in Syria, US Department of State spokesperson Mark Toner told reporters on Wednesday. Could Turkey's Top Court Undermine Erdogan's 'Quest for Unlimited Power'? President Recep Tayyip Erdogan has openly challenged the Constitutional Court's ruling that the detention of two opposition journalists had violated their rights as Turkey's top court along with the military are the only two institutions in the country that could "contain" his ambitions, Al-Monitor asserted. The president of Turkey’s main opposition Republican People's Party (CHP), accused President Recep Tayyip Erdogan of narcissism and of failure to comply with the country’s constitution on Tuesday. A Turkish constitutional court was debating the issue of human rights when it made the decision to free two local journalists from a leading opposition newspaper. However President Recep Tayyip Erdogan blasted the court. Turkey's Constitutional Court ruled on Thursday that the arrest of two Turkish opposition journalists Can Dundar and Erdem Gul is a violation of their rights. 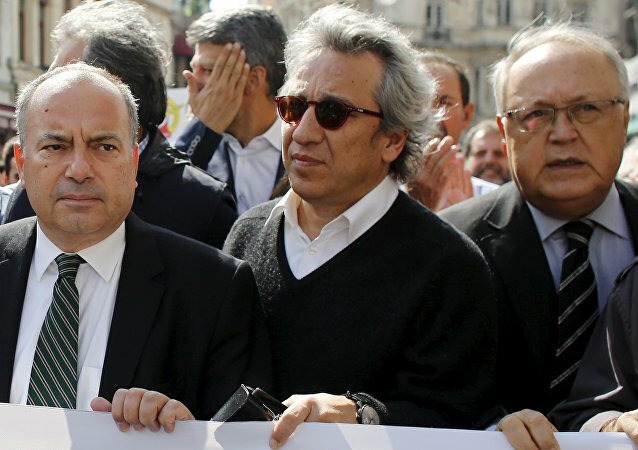 A Turkish court agreed to trial Cumhuriyet's Editor-in-Chief Can Dundar and the newspaper's Ankara representative Erdem Gulwere, with prosecutors demanding life sentences based on charges of espionage, according to local media. Recep Erdogan is converting Turkey into a police state by granting sweeping powers to the National Intelligence Organization (MIT) and cracking down on independent journalism and political opposition; in this light Erdogan's reference to Hitler's Germany as a presidential system model comes as no surprise. 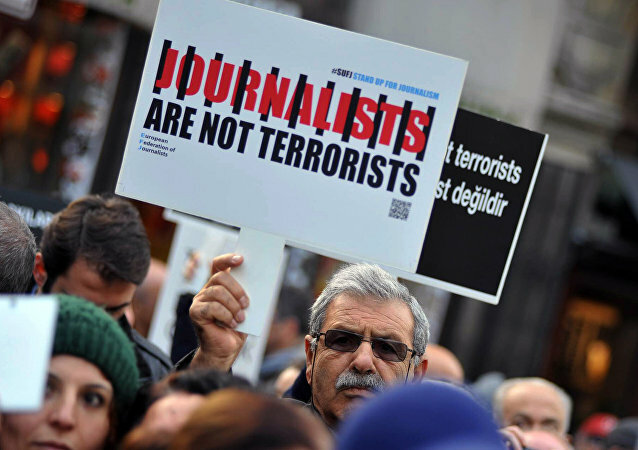 Turkish authorities have lost all respect for freedom of speech and are persecuting journalists who disagree with the government's policies, Deutsch Türkische Nachrichten (DTN) wrote. Turkish President Recep Tayyip Erdogan’s government used "state security" as a pretext to cover up smuggling of weapons into Syria and persecute the journalists who revealed it, imprisoned Cumhuriyet newspaper editor-in-chief, Can Dundar, said.